Back in September, I made the decision that I was done with iPhone – at least for a while. Last week, I was fortunate enough to start my new experience a little early, as Microsoft & Nokia gifted all developers attending Build 2012 a free Surface RT tablet and a free Nokia Lumia 920. My official #switchtolumia is complete. When I opened the box back at the hotel Tuesday night, I was surprised to see how spartan the contents were. This was truly a “developer” addition. It came with a tool for opening the SIM door, a Micro USB cable, and that’s it. Fine with me though – I don’t need or want any of the other frills. I’m not a professional tech reviewer. So, if you’re looking for some reviews, here’s one, and another, and another – I’ll just talk about my experience. Because the phone I received is not linked to AT&T, I had to do some setup. The commercial versions of the phone purchased from the carrier will likely be locked and setup for that carrier. For me, it was slightly trickier. Once pulling the SIM out of my iPhone 4s and placing in the Lumia, I selected one of the AT&T profiles and I was making & receiving calls & texts. But, I wasn’t seeing 4G (LTE). The next day I visited the Nokia booth at Microsoft, where they suggested I try the AT&T Store at the Microsoft Commons. A quick walk over there, and a helpful rep provisioned my account for 4G, and after power cycling the phone, I was good to go with 4G. I ran some speed tests on it and saw after about 5 tests, 15-18mb downstream 7-10mb upstream – WOW! I downloaded the Windows Phone for Mac software, configured my email accounts, and voila, I was in business. But, all my contacts were in Apple iCloud, what to do? Well, Google now has CardDAV support in addition to CalDAV. So, I decided to move my Contacts and Calendars to Google. Now that they’re stored in my Google account, all my devices and software (OS X, Windows 8, iPad, Windows Phone 8) all point to one place and when I make a change on one, they all get synced – SMOOTH. Podcasts, music, and photos all sync pretty effortlessly – actually MUCH faster than syncing an iOS device with iTunes. 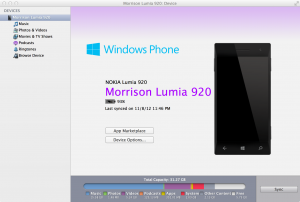 My impression so far – Windows Phone 8 is GREAT. It’s fast, smooth, and feels very intuitive. Everyone I’ve talked to about it always asks me about apps. As of this writing, 46 of the top 50 mobile apps are available on Windows Phone 8, and there’s over 100K+ total apps. Of course iOS and Android have more apps, but I have yet to have a situation where I can’t do something I was previously able to do. You find a way. And most of the apps I use have mobile web sites that work fine in Internet Explorer 10. 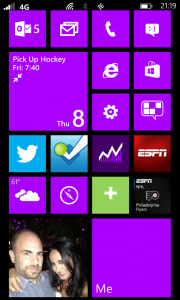 The best feature of Windows Phone 8 is the Live Tiles. It’s something the other mobile platforms don’t have and it’s aesthetically designed so elegantly. The (formerly named Metro) design language is beautiful and inspiring – the true meaning of “less is more”. The Lumia 920 is a large device. It definitely takes some time getting used to. It took me a few days to feel like I wasn’t going to drop it, holding it in one hand. It definitely feels heavy when holding to your ear. The voice quality is clear and crisp and the fidelity of the sound is loud and vibrant. I’m also pulling in a much better signal at my house than I was with the iPhone 4s and haven’t had any degradation in call quality. The glass and the display quality are better than iPhone and other Android devices I’ve tried. The speakers – loud. The camera – sharp. My biggest complaint so far is the battery life. It seems unless I’m ABC (Always Be Charging), I run out of juice by late afternoon when using data on the phone. That’s a problem. It should last all day. I’ve turned the 4G off and set the phone to 3G and we’ll see if that helps. I can always enable 4G when I need it. There are other nuances not worth mentioning, not significantly annoying – maybe they’ll be fixed in future updates. The switch is done and I’m happy about it. 11/16/2012 UPDATE: Battery life is actually GREAT. After a few charging cycles discharge / charge – repeat, I have a strong battery. Others have had similar success.